What is the effect of firms’ beliefs on their decisions and performance? This column explores this link using a unique survey of Japanese firms’ quantitative forecasts of future GDP growth combined with detailed company accounting data for over 1,000 large Japanese firms over 25 years. Firms’ input decisions and subsequent profit and productivity are found to react strongly to expectations of macroeconomic conditions, while significant heterogeneity in forecast accuracy across firms appears to be related to observable characteristics such as productivity, size, age, and governance structure. The results highlight a key role of firms’ forecasting ability for micro and macro performance. Ever since Keynes’ famous quote about animal spirits (Keynes 1936), there has been interest in the importance of firm expectations for business actions and outcomes. More recent work has established a key role for beliefs in determining resource allocations (e.g. David et. al. 2016) and in driving business cycle dynamics (e.g. Beaudry and Portier 2004, Schmitt-Grohe and Uribe 2012, Ilut and Schneider 2014). However, empirical evidence on the link between beliefs and economic performance has been limited due to a lack of firm-level panel data containing both expectations and outcomes. Key outstanding questions include: how much do beliefs matter for economic outcomes, under what circumstances, and to what extent does forecast accuracy vary across firms? First, optimistic forecasts of GDP growth are positively associated with employment, investment and revenue growth. Second, larger forecast errors (of either sign) lower profitability. Third, positive forecast errors reduce measured firm-level productivity, while negative forecast errors have insignificant effects. We provide a simple model of firm input choice under uncertainty and costly adjustment that rationalizes these patterns. Finally, larger and more cyclically sensitive firms make more accurate forecasts, as do more productive, older and bank-owned firms, suggesting that forecasting ability is linked to the return to forecast accuracy, as well as management ability, experience and governance. Our first main finding is that firm optimism/pessimism strongly affects input choices and growth rates. We summarise this result in Figure 1. 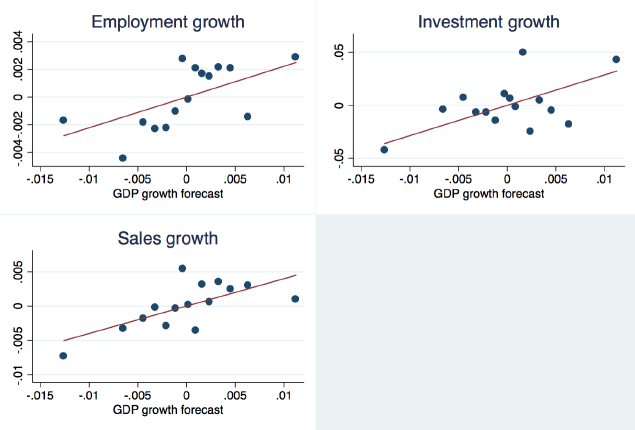 The figure displays binned scatterplots of firm-level forecasts of one-year-ahead GDP growth versus employment, investment and sales growth in the subsequent year. Each observation reflects a ‘bin’ of firms sorted by their level of optimism (or pessimism). Due to the longitudinal nature of our data, we are able to control for persistent firm characteristics and the realization of macroeconomic shocks (as well as any other time-varying factors that are common across firms, such as fluctuations in aggregate uncertainty) by extracting firm and time fixed-effects. The plots reveal a strong association between input and sales growth and firm expectations. The effects are statistically and economically significant – a 1% higher forecast of GDP growth is associated with a 0.2 percentage point increase in employment growth, a 2.8 percentage point increase in investment growth, and a 0.4 percentage point increase in sales growth. Next, we explore the relationship between forecast accuracy and firm performance, i.e. measures of profitability and productivity. Figure 2 summarises our findings, again using binned scatterplots after controlling for firm and time fixed-effects. The figure shows that larger forecast errors (of either sign) reduce firm profitability. The effects are substantial – a 1% increase in the forecast error reduces realized profits by about 8%. Grouping positive and negative forecast errors gives a similar pattern for firm-level productivity – a 1% increase in the forecast error reduces measured productivity by 0.6%. However, splitting positive and negative forecast errors reveals an asymmetry in the relationship – positive forecast errors (over-optimism) are associated with significantly lower productivity, but negative forecast errors (over-pessimism) do not have a significant effect on productivity. This asymmetry is not present when examining profitability. In our last set of results, we explore the relationship between forecast quality and a set of observable firm characteristics. We use two measures of forecast quality: difference from realised GDP growth and difference from forecasts by professional forecasters. Our findings reveal substantial variation in forecast accuracy across different types of firms. 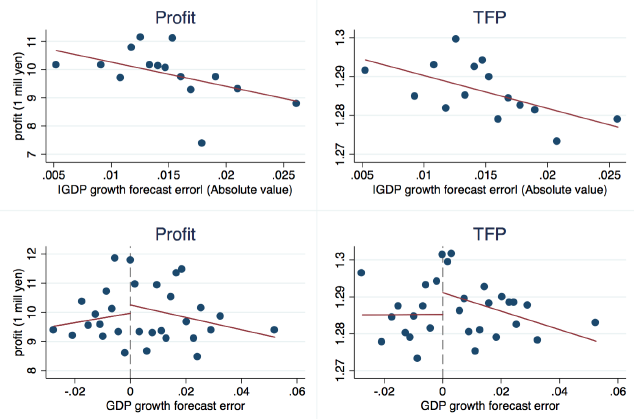 First, we find that more cyclically sensitive firms (firms whose stock prices are sensitive to announcements of realized GDP growth rates) make more accurate forecasts, presumably reflecting a higher return to accuracy for these firms. Additionally, we find that larger, more productive, older and bank-owned firms tend to have the most accurate forecasts. This latter set of results suggests that experience, management ability and governance may also play a role in determining firm-level forecast accuracy. Relying on a novel dataset with information on firm expectations and outcomes, our work reveals a strong connection between beliefs regarding macroeconomic conditions and subsequent firm performance. Our results point to an important role for expectations in determining economic performance, both at the firm and aggregate level. Further work quantifying these relationships and uncovering the sources of forecasting ability would be fruitful in understanding the determinants of the information environment in which firms operate and may provide guidance as to whether there are actions that could be taken to better forecast accuracy. Our findings suggest that improving information quality could yield substantial economic benefits. Beaudry, P and F Portier (2004) “An Exploration into Pigou’s Theory of Cycles,” Journal of Monetary Economics, 51(6): 1183-1216. David, J M, H A Hopenhayn and V Venkateswaran (2016) “Information, Misallocation and Aggregate Productivity,” The Quarterly Journal of Economics, 132(2): 943-1005. Ilut, C L and M Schneider (2014) “Ambiguous Business Cycles,” The American Economic Review, 104(8): 2368-2399. Keynes, J M (1936) The General Theory of Employment, Interest, and Money, Harcourt, Brace. Schmitt-Grohe, S and M Uribe (2012): “What’s News in Business Cycles,” Econometrica, 80(6): 2733-2764. Tanaka, M, N Bloom, J M David and M Koga (2018) “Firm Performance and Macro Forecast Accuracy,” NBER Working Paper 24776. We perform a number of exercises to verify the quality of the forecast data, i.e. that these forecasts accurately capture firms’ expectations of future growth rates. We also address issues of sample selection. These predictions hinge on two key features of the environment: first, that the econometrician measures revenue productivity, which includes the effect of prices, and not physical productivity. Second, that the disruption costs reduce output and are not pure financial adjustment costs.